A rural orchard setting in the Central Valley offered an opportunity create this European revival estate. The challenge was to unify a sprawling 6,000 sf home and develop a cohesive living environment with panoramic views to the surrounding orchards. The main entry includes a dramatic circular stair to the upper level. A second (rear) stair connects the upper level bedroom concourse with the family area and kitchen. This becomes the primary connection for family members. The living spaces gaze at the terracne and expansive “competitive” pool area and to the orchards beyond. A dramatic sense of arrival was achieved by the use of a thematic tower element and barrel trellis. Clay tile roofing, modeled plaster walls, and iron grillwork and detailing complete the exterior character. 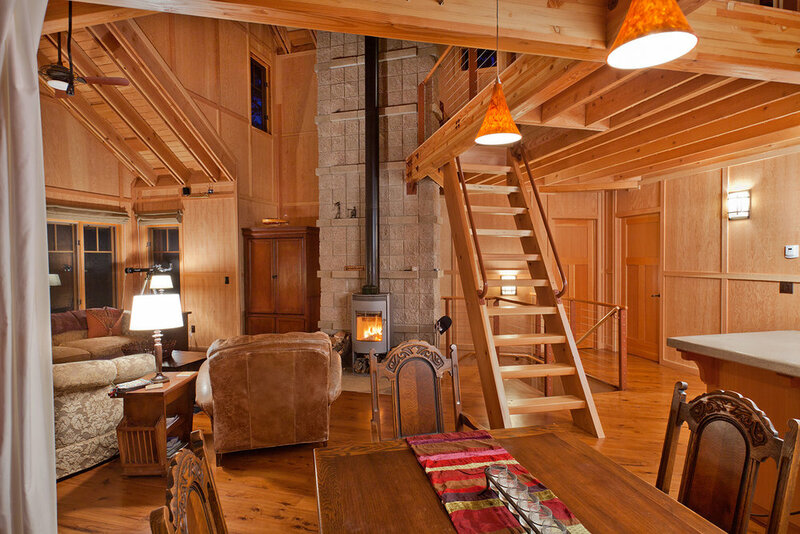 Located in the western Sierra Nevada Mountains near Quincy California, this 1,800 sf vacation home blends into its natural surroundings, responds to the fire dangers of forest construction, and recognizes the vital importance of sustainable design. The home was designed to pursue USGBC LEED certifications for homes. The construction of the home began with a concrete masonry foundation, composed of regionally manufactured materials, is mechanically attached to the granite substrate of the mountain site. The masonry coursing reinforces the layering of the significantly slope site. Poured-in-place concrete columns support the recycled content steel framed cantilevered floor systems. 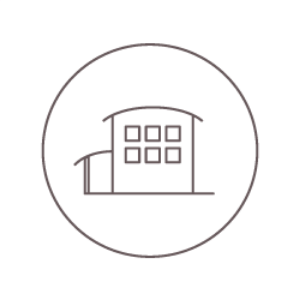 FSC certified wood frame construction and exterior siding combine with fire resistive recycled steel siding comprise the main structure of the home. The roof structure is a compilation of b intersecting at a common masonry “spine” Exterior windows are dual insulated, low E, wood windows. 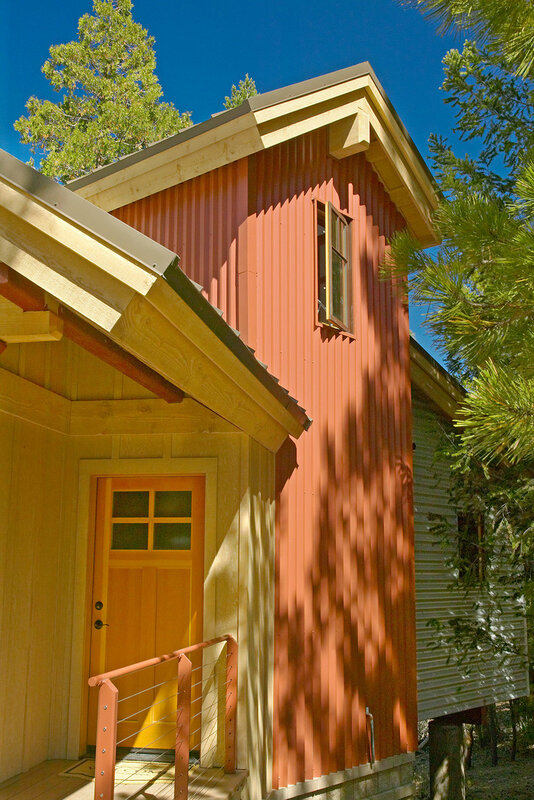 A unique steel roll-up “garage door” was employed to provide connectivity between interior space and the exterior deck. Because of the frequent and extreme weather conditions including snow, ice, and heavy winds a steep roof slope and recycled steel roofing materials were selected. The home is can be passively heated and cooled through the interior masonry “spine” provides the primary support for the main roof members. 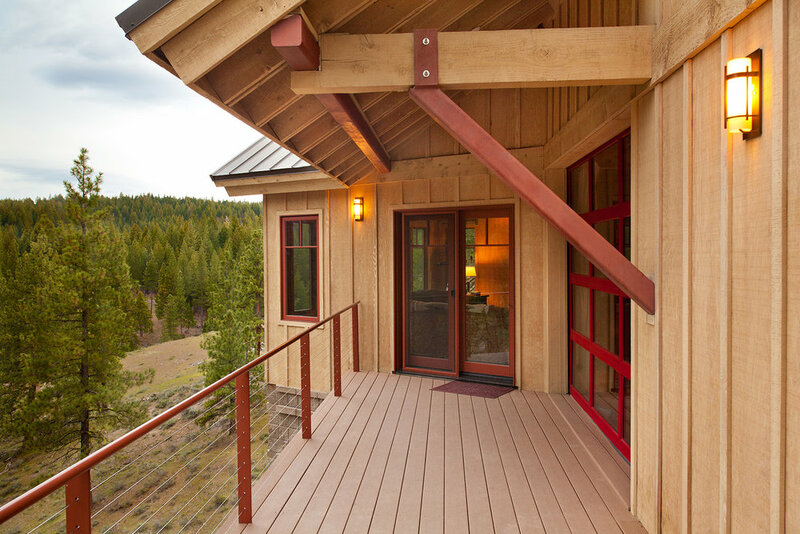 This “spine” provides thermal mass for collecting and storing heat generated by the home’s wood stove. The masonry “spine”, through the use of a varied coursing pattern, also functions as the family “climbing wall”. Summer cooling can be affected by a natural convective system of air flow from the lower floor through the loft clerestory portals. The interior incorporates recycled steel in the railings, low VOC finishes were used for staining and adhesives in the casework and interior woodwork, and Energystar rated appliances.